In a March 14 post, I discussed the primary factor in the initial decline of Sacramento River winter-run salmon in the early 1980s (Figure 1) – higher south Delta exports in drier years after the State Water Project came on line in the 1970s. In a January 15, 2017 post, I discussed the causes of the recruitment failures from poor egg survival in spawning grounds in summers of 2014 and 2015. 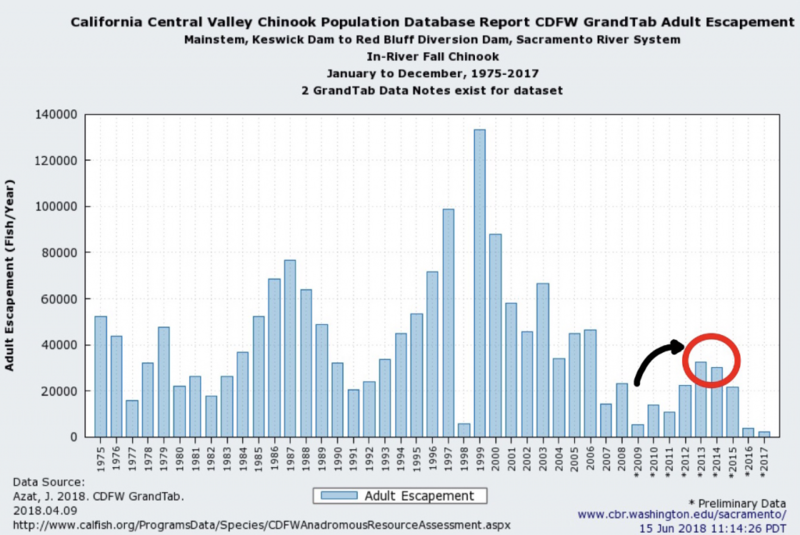 In this post, I suggest that recruitment into the population and long-term population declines stems from fewer spawners (eggs produced) over time and low Sacramento River flows (Shasta Reservoir releases) in fall and winter. 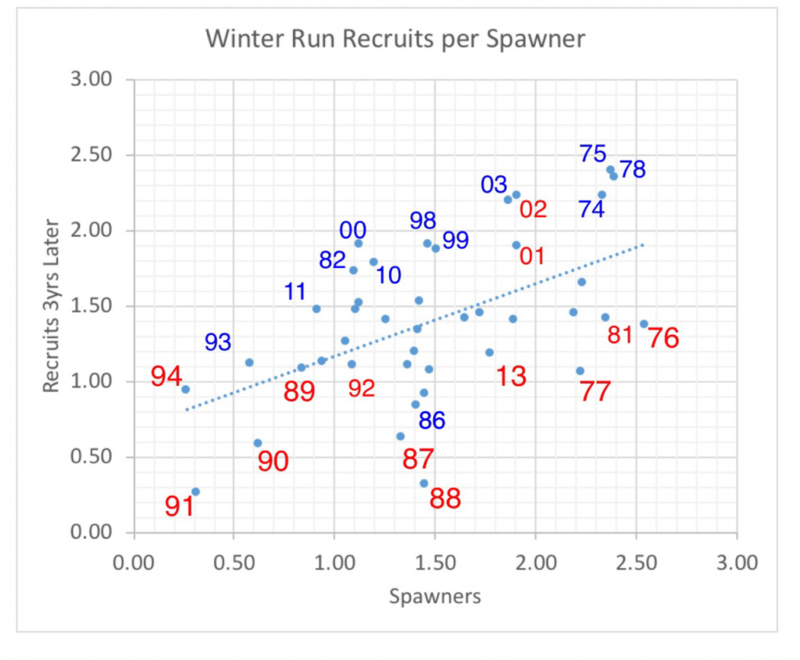 The spawner-recruit relationship (Figure 2) depicts a strong positive effect of the number of spawners on the number of recruits into the population. This is important because mortality reduces the number of spawners and also the subsequent years’ egg production – a double whammy. Without mitigation, the population spirals toward extinction. In addition, the relationship suggests that ten times as many salmon are produced in wetter years as in dry years for the same level of spawners. Over the past decade, drier years have lower fall and winter river flows in the upper river spawning and early rearing reach (Figure 3), and lower winter flows in the lower river rearing and migratory reach (Figure 4). The lower fall-winter flows reduce the productive capacity and survival of young salmon in the upper river spawning-rearing reach. The low winter flows in the lower river reduce transport and survival on the way to and through the Delta. The road to recovery is to build up the number of spawners by providing better flows in fall and winter, and to ensure eggs are sustained by cold-water Shasta Reservoir releases through the summer. Hatchery augmentation helps sustain existing low levels of adult spawners in the population; otherwise the population would decline toward extinction in fewer generations. Figure 1. Spawning population estimates of adult winter-run salmon in the upper Sacramento River from 1974 to 2017. Source: CDFW. Figure 2. Spawner-recruit (log-log) relationship for the winter-run salmon population in the Sacramento River. The number is the brood year. For example: 1991 depicts the recruits derived from 1991 spawners. Red represents drier years, and blue represents wetter years for the brood year’s first summer and fall. For example: 1991 was a dry year. Figure 3. 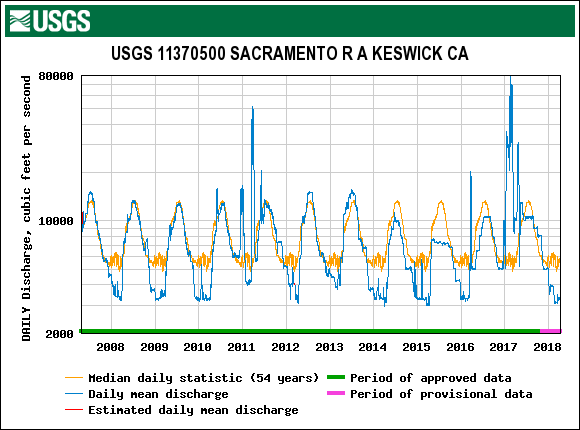 Daily average Sacramento River flow below Keswick Dam, 2007-2018. The 54-year average median daily flow is also shown. Source: USGS. Figure 4. 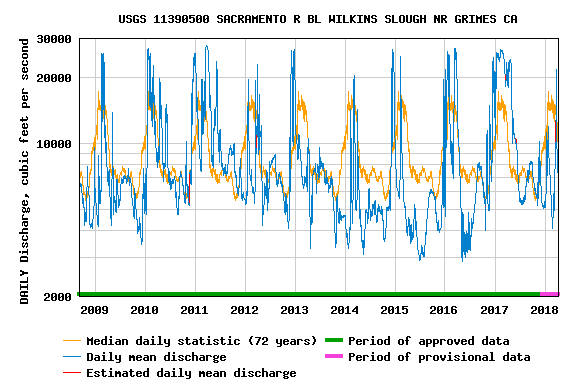 Daily average lower Sacramento River flow at Wilkins Slough, 2008-2018. The 54-year average median daily flow is also shown. Source: USGS. More on Sacramento River Salmon Declines Reclamation did what it had to do in water years 2010 to 2012, but not in 2016-2018. So did Reclamation provide good spring-summer conditions in the lower Sacramento River in below-normal, wet, below-normal water year sequence 2016-2018 to help recovery from the latest drought? No. As a result, we can now expect poor runs in 2019 and 2020 instead of a recovery. Reclamation made a concerted effort in 2010-2012 to meet water temperature objectives in the upper river near Red Bluff (Bend, Balls Ferry, and Red Bluff) and the lower river near Sacramento (Wilkins Slough, Verona). The 56°F and 68°F water temperature objectives for the upper and lower river, respectively, were regularly met (Figures 2-4) in spring and summer. In a less than concerted effort in 2016-2018, Reclamation has failed to meet the water temperature objectives more often and with greater discrepancies (Figures 5-7). More detail on the failure is provided in a recent post. The causal factor is simply lower flows in spring and summer 2016-2018 than 2010-2012 (Figure 8). 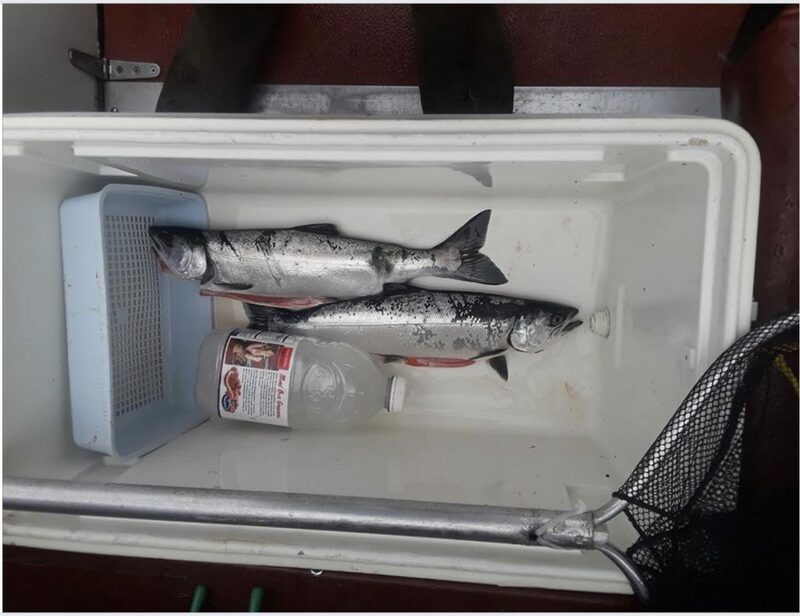 Lower flows, higher water temperatures, and lower turbidities lead to poor salmon smolt survival (and low adult migrant survival and subsequent egg viability). A concerted effort to recover salmon would mean maintaining water temperature objectives with spring-summer flows in the lower river at Wilkins Slough in the 7000-8000 cfs range instead of the 5000-6000 cfs range (Figure 8). This may require a supplemental release from Shasta Reservoir as in 2012 (Figure 9), which amounted to nearly 200,000 acre-ft of storage release, so that storage ended at 2,600,000 acre-ft at the end of September. The target end-of-September storage in below-normal water year 2018 is 2,300,000 acre-ft. With water deliveries near 2 million acre-ft from the Sacramento River in 2012 and 2018, a “concerted effort” involving 200 thousand acre-ft to maintain water temperature objectives prescribed in the water right permits seems reasonable. Whether it comes from Shasta storage or water contractor deliveries is a management/permitting agency decision. Figure 1. Long-term trend in upper Sacramento River fall-run salmon escapement. Red circle denotes recovery from low escapement from 2007-2009 drought. Figure 2. 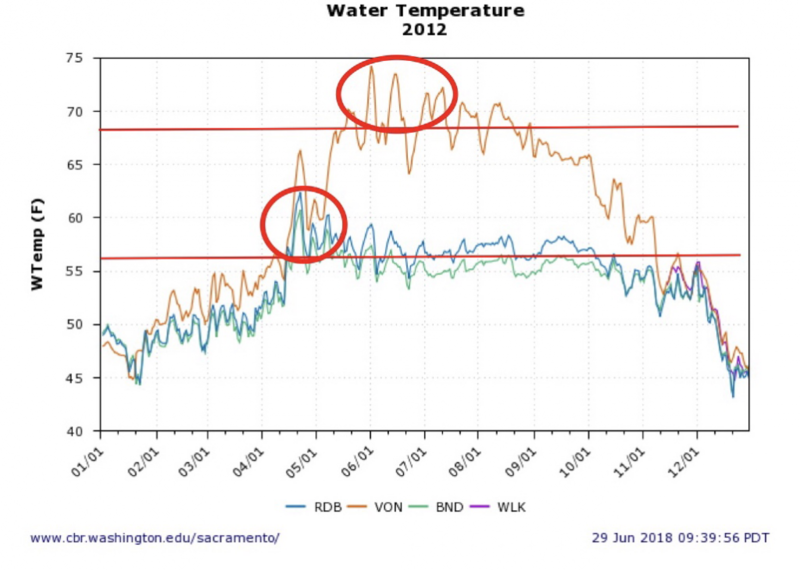 Water temperature in the upper (Red Bluff, Balls Ferry) and lower Sacramento River (Verona) in 2010. Top red line denotes objective for lower river (68°F); bottom line denotes objective for upper river (56°F). Red circle denotes excessive temperatures. In 2010, a below-normal water year following three years of drought had water temperatures near objectives. Figure 3. 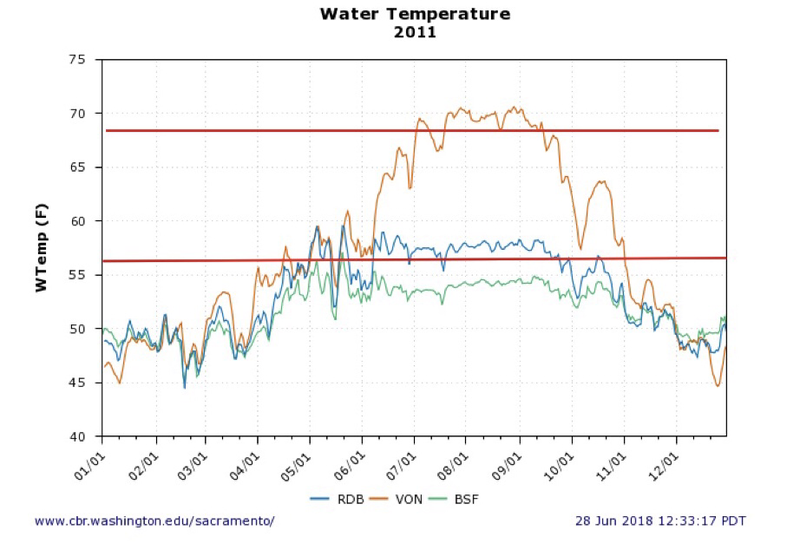 Water temperature in the upper (Red Bluff, Balls Ferry) and lower Sacramento River (Verona) in 2011. Top red line denotes objective for lower river (68°F); bottom line denotes objective for upper river (56°F). In 2011, a wet water year had water temperatures near objectives. Figure 4. Water temperature in the upper (Red Bluff, Balls Ferry) and lower Sacramento River (Verona) in 2012. Top red line denotes objective for lower river (68°F); bottom line denotes objective for upper river (56°F). Red circles denote excessive temperatures. In 2012, a below-normal water year following a wet year had water temperatures near objectives. Figure 5. 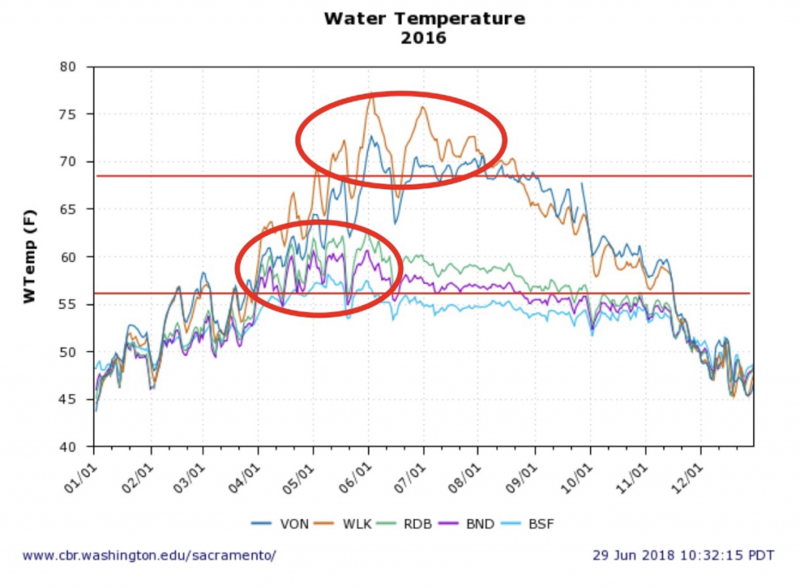 Water temperature in the upper (Red Bluff, Bend, Balls Ferry) and lower Sacramento River (Wilkins Slough, Verona) in 2016. Top red line denotes objective for lower river (68°F); bottom line denotes objective for upper river (56°F). Red circles denote excessive temperatures. In 2016, a below-normal water year following three drought years had water temperatures exceeding objectives April through July. Figure 6. 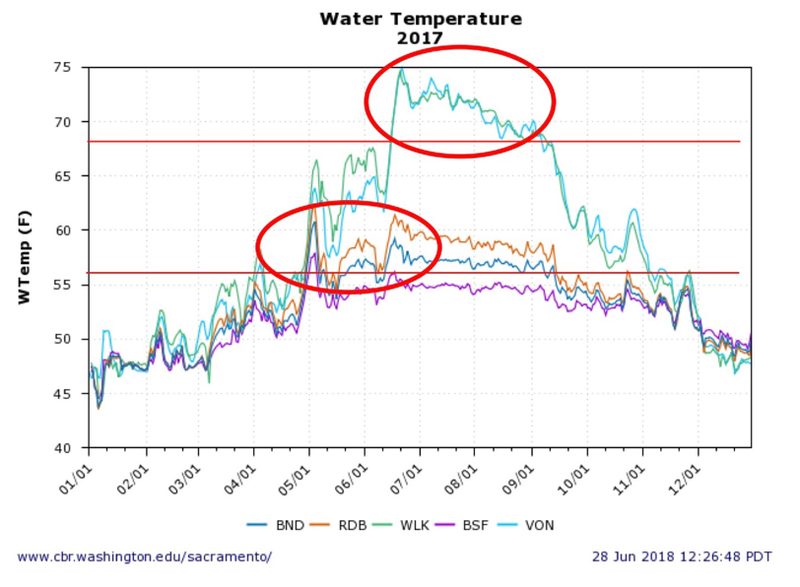 Water temperature in the upper (Red Bluff, Bend, Balls Ferry) and lower Sacramento River (Wilkins Slough, Verona) in 2017. Top red line denotes objective for lower river (68°F); bottom line denotes objective for upper river (56°F). Red circles denote excessive temperatures. In 2017, a wet water year had water temperatures exceeding objectives May through August. Figure 7. 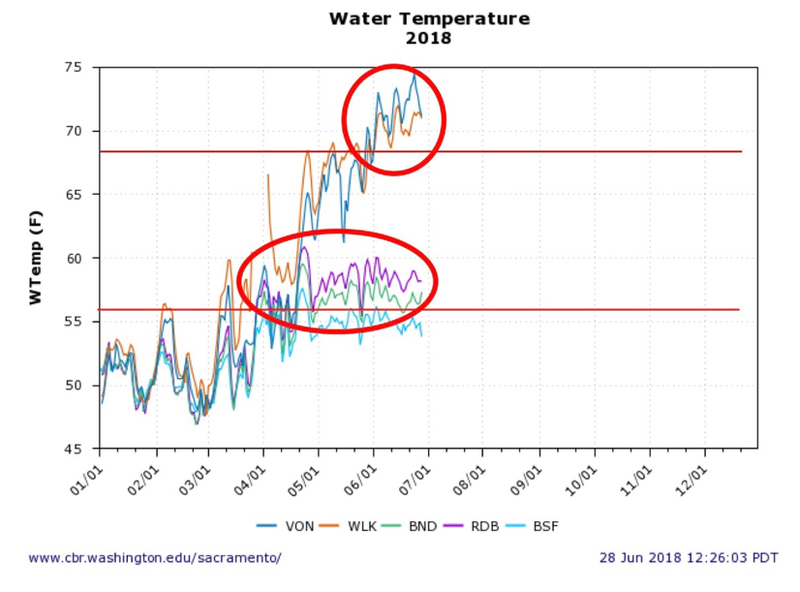 Water temperature in the upper (Red Bluff, Bend, Balls Ferry) and lower Sacramento River (Wilkins Slough, Verona) in 2018. Top red line denotes objective for lower river (68°F); bottom line denotes objective for upper river (56°F). Red circles denote excessive temperatures. In 2018, a below-normal water year following three drought years had water temperatures exceeding objectives April through June. Figure 8. 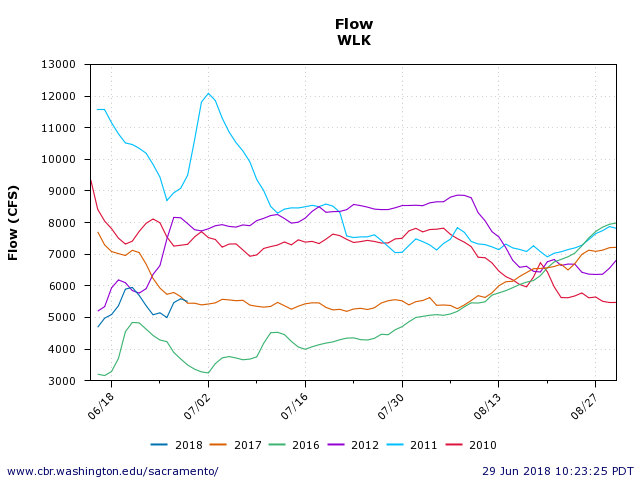 Summer flow in the lower Sacramento River (Wilkins Slough) in 2010-2012 and 2016-2018. Figure 9. 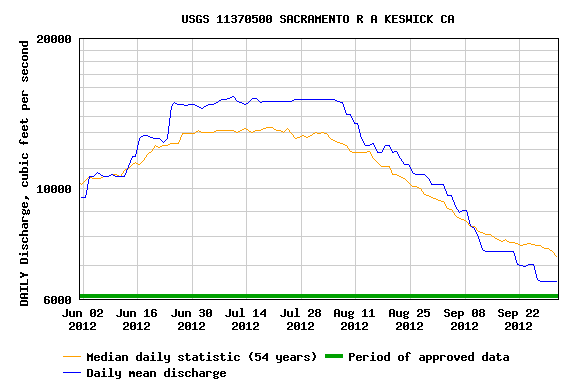 Releases of water from Keswick Reservoir to the lower Sacramento River in 2012 compared to 54 year average. Low flows in the lower Sacramento River above the Feather River and warm flows from the Feather River are compromising the summer habitat of smelt and salmon in the lower Sacramento River and the Delta, violating state and federal water quality standards. The Sacramento River at Wilkins Slough at river mile 118, 63 miles upstream of the Sacramento Delta, has low flows and high water temperatures (Figure 1). The high water temperatures are a violation of the 68oF (average daily) water quality standard and are stressful to migrating salmon. The lower Sacramento River 50 miles downstream of Wilkins Slough at Verona, just downstream of the mouth of the Feather River, has near lethal water temperatures, far above the water quality standard (Figure 2). The high temperatures are likely due in part to recent increased releases from Oroville Reservoir to lower water levels for the spillway repair project. The lower Sacramento River at Freeport in the north Delta, 25 miles downstream of Verona, has near lethal water temperatures for Delta smelt (Figure 3). The high temperatures are likely due in part to recent increased releases from Oroville Reservoir to lower water levels for the spillway repair project. 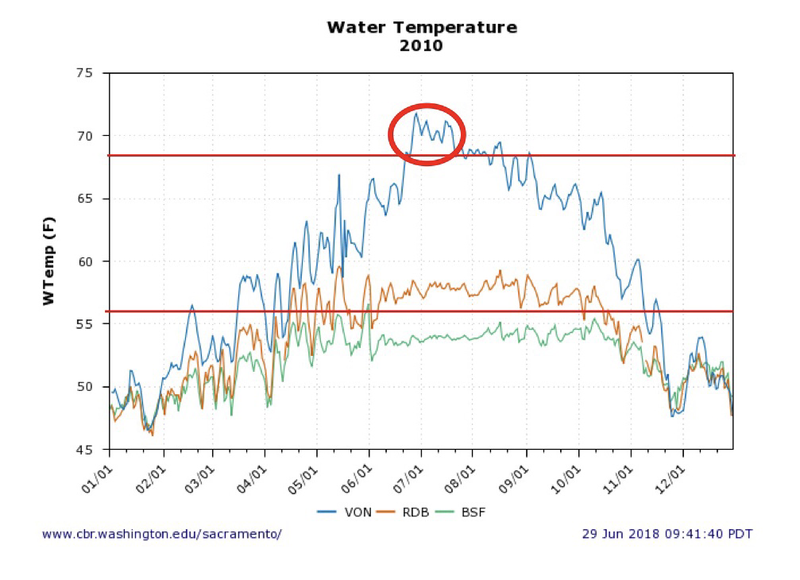 The north Delta water temperatures are also high in part due to lower than normal net river flow (as measured at Rio Vista 20 miles downstream of Freeport – Figure 4). 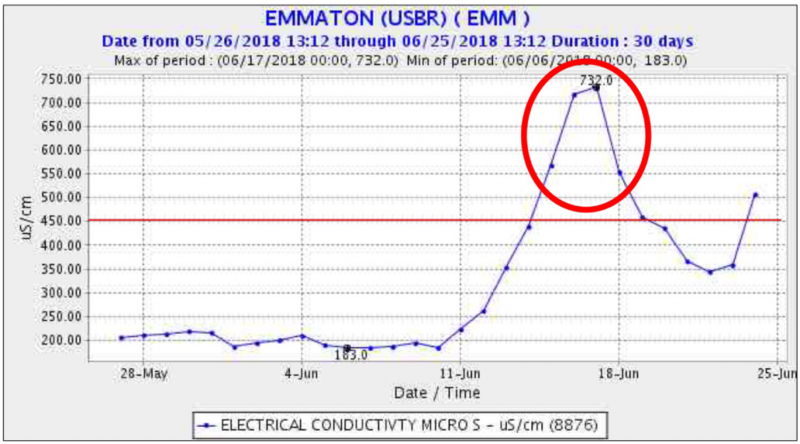 The low flows have also led to encroaching salinity at Emmaton several miles downstream of Rio Vista (Figure 5), also in violation of water quality standards. Figure 1. 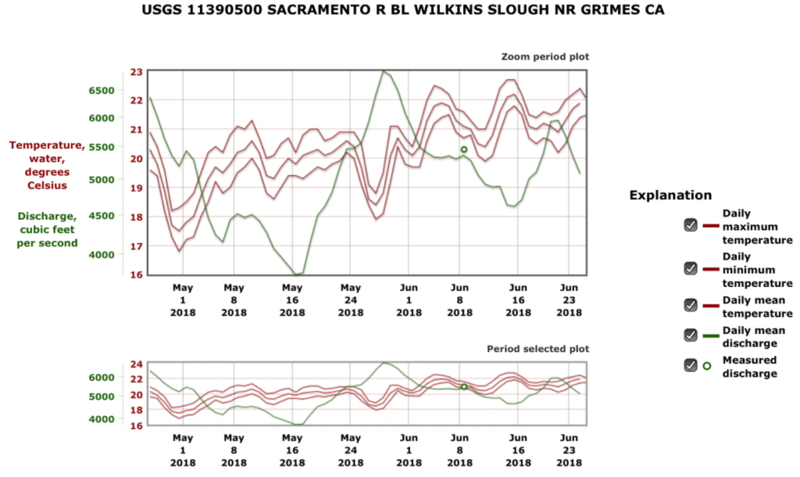 Sacramento River at Wilkins Slough flow and water temperature in May-June 2018. The water temperature standard for the lower Sacramento River is 20°C (68°F). Figure 2. 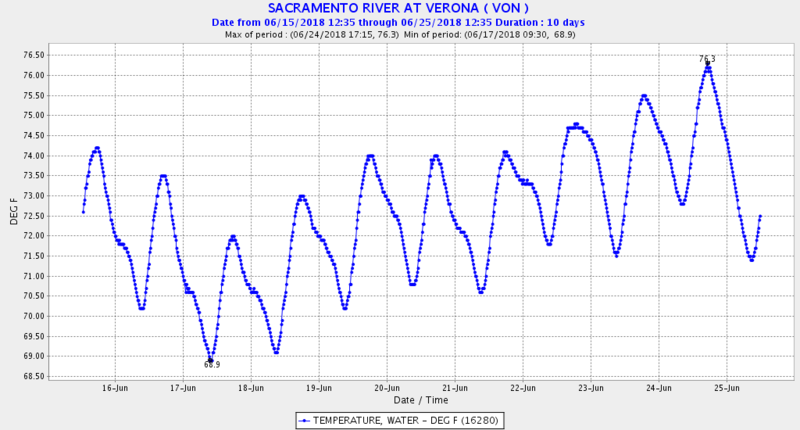 Sacramento River at Verona water temperature 6/15-6/26, 2018. The water temperature standard for the lower Sacramento River is 20°C (68°F). Figure 3. 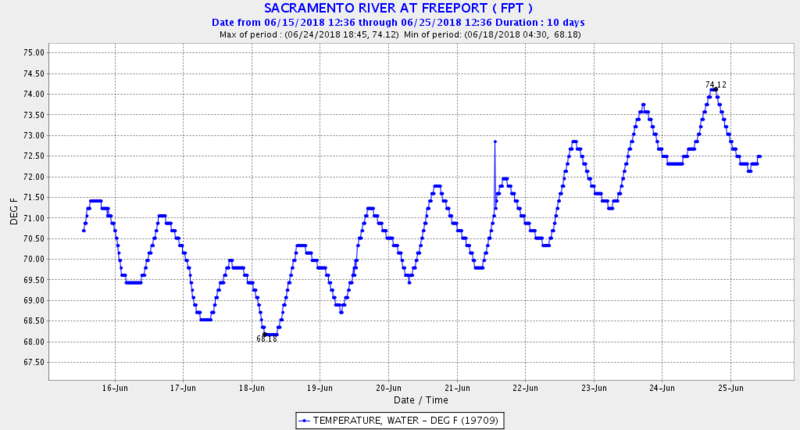 Sacramento River at Freeport water temperature 6/15-6/26, 2018. The water temperatures above 72°F are stressful to Delta smelt. Figure 4. 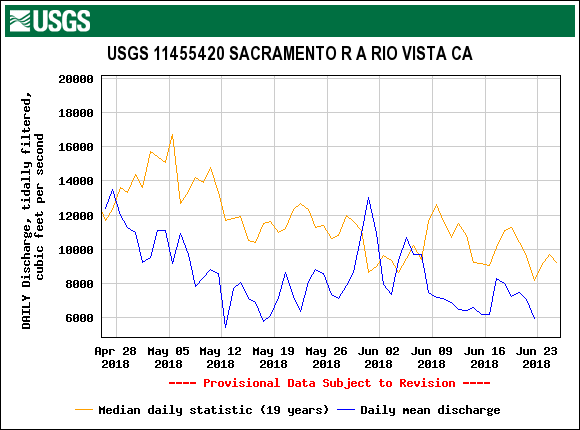 Rio Vista daily average historical and 2018 flow May-June. Figure 5. Salinity (EC) at Emmaton near Rio Vista. The standard of 450 EC (uS/cm) was exceeded from 6/15 to 6/18, 2018. The standard is necessary to keep the low salinity zone, critical habitat for Delta smelt. west of the Delta.